On 17th September, 2010, I received an email from Steve Rose, all it said was "Sad news, please ring me urgently, about Will Brown." Even before I phoned Steve I guessed I was never going to see Will again and probably the reason why. 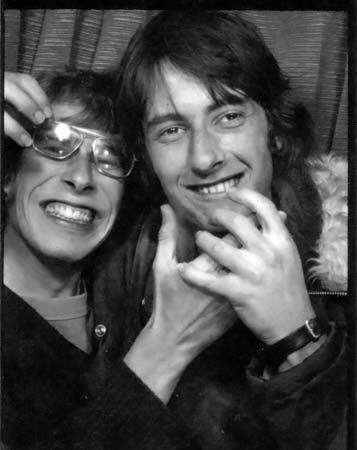 I first met Will when I was a young teenager when I used to go to meetings of the Bristol Astronomical Society at Bristol University in the early 1970's and we quickly became good friends. Having been bought up on one the large council housing estates at Knowle in South Bristol, I remember going to his house in Cotham and at the time I thought it was a mansion. 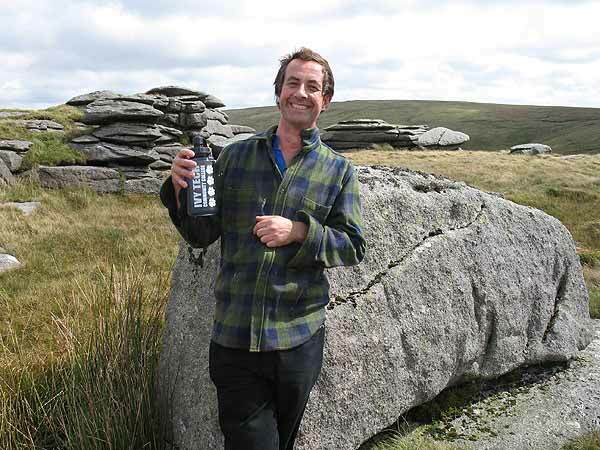 Peter, Will's father, worked as a television correspondent for the BBC and his mother was a teacher. One room of their house was wallpapered in Ordnance Survey maps which I thought was particularly cool. I spent many happy evenings at Will's house, the only drawback was the near five mile walk I had to get home. The 70's and 80's were a time of great excitement for us. 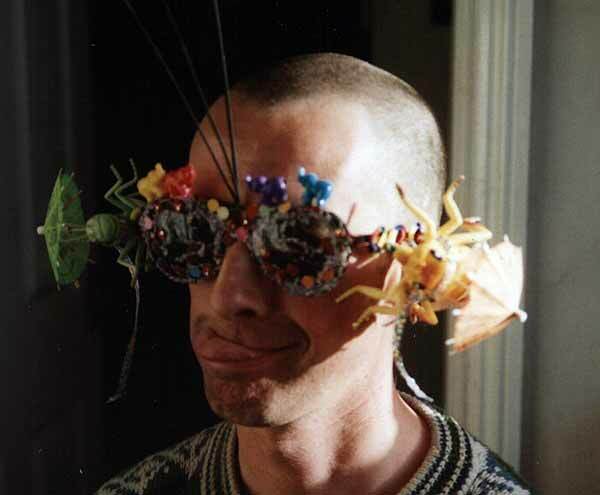 Will was always fun to be around, he had a quick, inventive mind. We'd buy a flagon of cider each, get ourselves outrageously drunk and gatecrash parties all over Clifton, Cotham, Kingsdown and other parts of Bristol. Will and I got ourselves chucked out of some very good parties! We'd go and see various bands, sometimes hitch-hiking to London. I remember a "Midsummer Night's Party" we had on the Downs where the police turned up and wanted to know why a couple of dozen teenagers were drunk. Even in those days Will was interested in politics and art, we'd spend lot of time in the Arts Center in Kingsdown and Will broadened my horizons by watching films like "The Seventh Seal", "Bring Me the Head of Alfredo Garcia" and "THX 1138". One of our favourite hangouts was "The Magic Mushroom Cafe" down in Hotwells. This was an all-night cafe where we'd sit around chatting, eat beans on toast, drink jasmin tea, listen to songs on one of the best stocked juke boxes in Bristol and play on an ancient pinball machine where you were lucky to score a couple of thousand points, not the millions you could get on more modern machines. It was about this time that, due mainly to Will, that we formed the Bristol Branch of the National Union of School Students. Other members I can remember were Vicky Hough, Paul Dixon, Charlie Molton, Chris Reed and Christina Earls. We'd organize fund-raising events like hiring Tiffany's nightclub in Clifton. The first couple were not a great success and the only people who actually went to them were us and few other friends. They got better though. Tiffany's had these stupid day-glo fibreglass palm trees and every time we went there everyone came home with bits of day-glo paint and fibreglass stuck in their clothes from them. 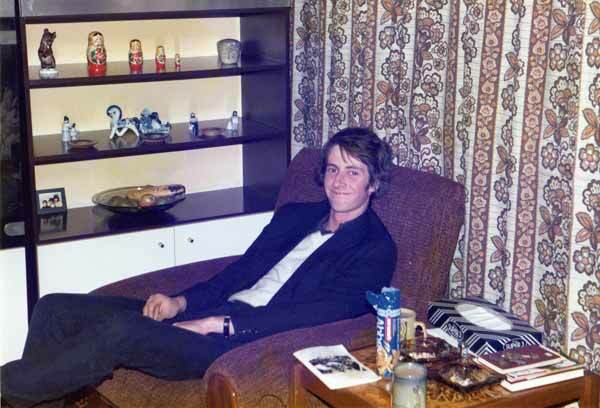 It must have been about this time that Will left Bristol to go to Manchester University to study physics. We stayed in touch by letter and it was with surprise that one day I read that Will had suffered a nervous breakdown after a year of studying and was now working in a steel mill producing nuts. When he got home he didn't seem much different but he was really upset with his parents who seemed to be, in their turn, upset with Will for giving up his studies. Thankfully, their differences were later settled. That breakdown was the first signs of the depression that would plague Will for the rest of his life and would later lead to his untimely death. Will would sometimes try to talk to me about things that bothered him but out of all his friends, and Will had many, I was probably the least able to help him. It wasn't that I was unsympathetic, just that at the time I had no experience of mental problems at all. The best I could do was let him talk and listen as well as I was able to. Everyone liked Will, even my mum who wasn't at all impressed with some of my other friends. Both Will and I loved wandering around Bristol, either on our own, in each other's company or with a bunch of friends. Will, even then had strong socialist leanings, and when Margaret Thatcher became Prime Minister in 1979, even though I was, and still am, politically naive, I could see what was happening. I remember a television satirical program called "Spitting Image" and one of the skits was U.S. President Ronald Reagan meeting Thatcher. As she left the room he turned to one of his aides and said "I wish I was doing to her what she's doing to Great Britain." Another skit was Thatcher sat in a restaurant with her Cabinet. The waiter asked her what she wanted and she said "Raw steak." The waiter then asked "What about the vegetables?" to which she replied "They'll have what I'm having." It was through Will, who even then was a tireless campaigner and the most politically active person I knew, that we'd go on some of the massive protest marches in London that were taking place at the time such as the Anti Nazi League's Rock Against Racism rally in Victoria Park, Hackney, London in April, 1978, the "People's March for Jobs" and "Rock for Jobs" in Brockwell Park, Lambeth, London in May, 1981 and various other demonstrations against cuts in education and the National Health Service. That was one thing that stayed with Will all his life, his infectious enthusiasm for anything and everything that caught his attention, that he considered right and just and his ability to fire other people with his enthusiasm. 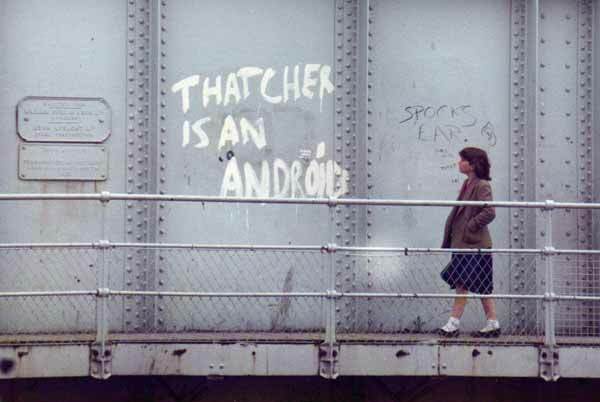 We both liked some of the less banal graffiti that was appearing all over the country at the time. One of the others we thought was great was the one that said "Worried about nuclear global politics? Not me, I just want to nuke and go." that was painted on a long section of Bath Bridge near Temple Meads railway station. In later years Will told me that he was hoping to document some of the more interesting graffiti around Bristol. I hope he made a good start on it but I've no idea how far he got with the project. With Margaret Thatcher as Prime Minister (1979 to 1990) the unions had a tough time. One of her goals seems to have been the complete destruction of the labour unions. 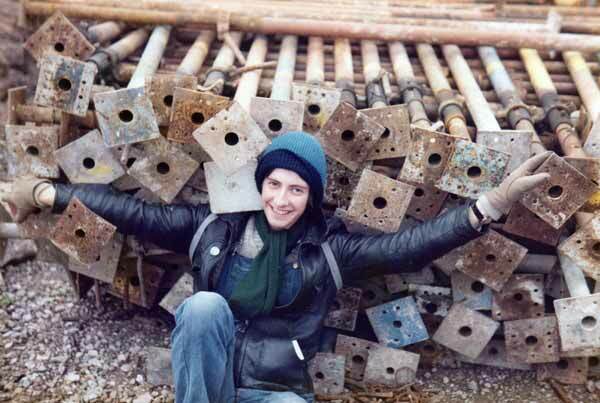 In 1984, the National Coal Board decided to close 20 coal pits with the loss of 20,000 jobs. Not surprisingly, some National Union of Mineworkers branches started striking on 5th March, 1984 followed by a national strike of the NUM on 12th March. Many striking mineworkers families were without any income at all and were in desperate straits and Will was the leading force in south Bristol to support the Cynheidre Colliery Lodge in South Wales. 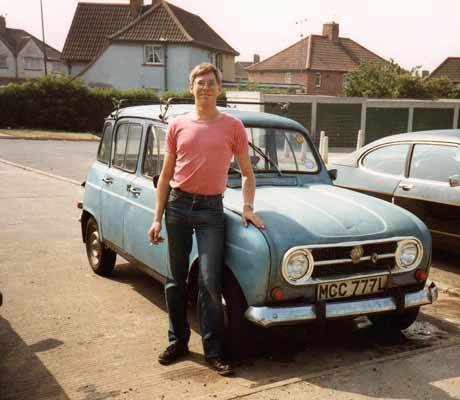 We collected food for them and sometimes used my old Renault 4 to take it over to them. The strike lasted almost exactly a year and ended on 3rd March, 1985. 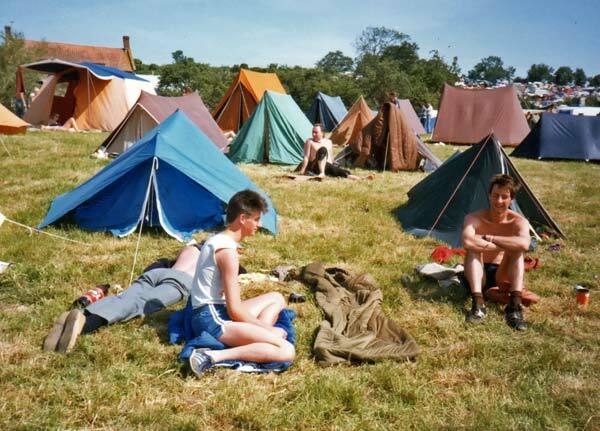 One thing Will and I really had in common was a wide-ranging taste in music and a group of us went to the Campaign for Nuclear Disarmament "Glastonbury Festival" benefit gigs at Pilton, near Shepton Mallet in Somerset. 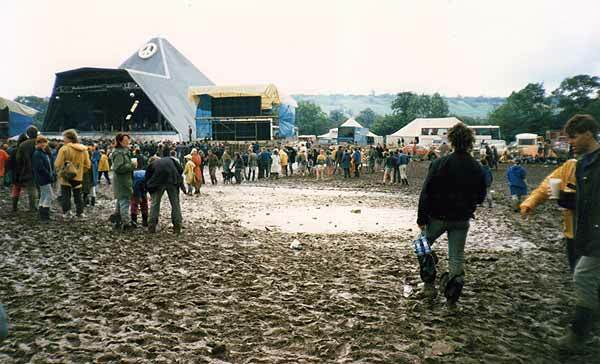 The 1985 Glastonbury was particularly wet. Jonathan Richman had had a couple of hits with "Roadrunner" in 1976 and the following year with "Egyptian Reggae". He was extremely pissed off when the crowd started crying out for these almost 10 year old songs. Also that year Ian Dury was playing, but not for long. Some people started throwing mud at him and he stormed off stage. Nearly all the bands had mud thrown at them, after all there were 40,000 of us, all filthy, cold and wet while the bands came on clean, warm and dry, what did they really expect to happen? One thing that stands out from that year's festival was Alexi Sayle coming on stage and saying "someone's lost a contact lens, do you mind looking around for it?" 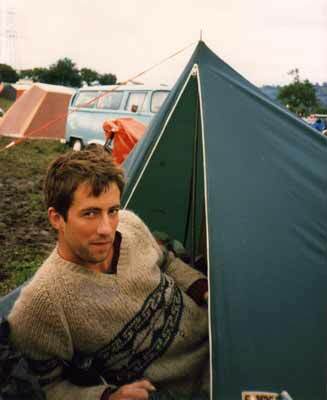 We went to Glastonbury several times. One year we went and a friend of ours brought a biscuit-tin full of hash cake. She disappeared for several hours into the crowd with the idea of selling it. A while later she returned stoned out her mind. Apparently she didn't sell much of it so just ate it all. One time my brother, Dave, came with us and Will would sometimes retell the story of what he did. The Bishop of Bath and Wells was making a speech when my brother turned to Will and said "Good lyrics but the tune's rubbish." Later on the same day Dave turned around to face the tens of thousands people behind us and shouted "Will you all please stop pushing and take a step backward." Surprisingly, a whole section of the crowd did! Will and I just fell about laughing. Will and I drew a little apart during the early 90's. We didn't stop being friends it's just that we were pursuing other interests but it was always a pleasure to meet up with him, have a drink, see a band or whatever. We always kept in touch and both knew we could always contact each other. Sometimes though Will never returned my phone calls and never seemed to be at home when I went round his house. Usually this didn't worry me, Will had plenty of other friends and lots of interests. The problem was that Will sometimes had periods of depression that he had problems coping with and it bothered me that perhaps he was hiding himself away somewhere, trying to cope on his own. My first marriage was a bit of a disaster to say the least. I didn't realize that my wife suffered from paranoid schizophrenia for which she wasn't being treated and when she did she quickly stopped taking her medications. It all ended in divorce a couple of years later. I was bankrupt and she ended up in permanent care. The only good thing to come out of the whole business was that I had a little better understanding of some of what Will was going through. Have you ever seen the film "A Beautiful Mind"? It's the story of mathematician John Nash's struggle with mental disease. It's a great film but isn't anywhere near what someone suffering from schizophrenia, or their families, goes through. Just to make this clear, Will never suffered from schizophrenia but from depression, but what the experience did for me was to give me some insight into what people with mental problems go through. Will and I would sometimes have long conversations about the way he was feeling when he was depressed. Although I did my best it would sometimes aggravate Will that I couldn't always see what he was going through. By the end of 1998 I'd more or less made up my mind I was going to get married to Patty, someone I'd started chatting to online, and live in the United States. Will and I started seeing a lot more of each other. 2000, my last year in the UK, was a lot of fun. Will, myself and a couple of others got drunk in the harbour outside the Arnolfini. There were a group of students from Bristol University there, as drunk as we were but a lot louder. One of them was saying as how he'd got his whole life planned out, get his degree, a good job with an international company, spend a few years working in various countries for this international, get married, have kids etc. Me and Will were listening, we had no choice, this guy was really loud, and just fell about laughing. The very last gig I went to with Will was to see "Alabama 3" at the Fleece and Firkin in St. Thomas Street. I had a collection of cacti, one of which was a beast. It had large round flat leaves with sets of three large barbed spikes. I was forever being spiked by the thing and I ended up giving it to Will just before I moved to the United States. In October 2001, I left Bristol and moved to Terre Haute, Indiana - about 200 miles south of Chicago. Will and I emailed each other almost weekly. In January 2002, Will wrote to me saying that "... your cactus continues to spike me regularly. Have finished my CAB training so start advising the unfortunate people of Bristol next week. I think my main advice will be "cheer up and pull yourself together"... Have started building a bizarre sculpture featuring a waterfall of paint, a guillotine and two sledgehammers." Funnily enough "cheer up and pull yourself together" and "all you need is a good cup of tea" was what I used to jokingly tell Will. He'd write often telling me what he was up to. It was always interesting hearing from Will and the various projects he was involved in. Patty and I tried to get back to the UK whenever we could and getting to see Will again was always fun. In 2004 I persuaded him to come over to Indiana to visit us. It was something he looked forward to and he'd email regularly all though the summer of autumn of 2004 chatting about the visit in January 2005. I warned him Indiana in Winter was going to be cold that that year was particularly bad. Patty and I drove up to Chicago to get him from the airport. We spent a couple of days in Chicago. Patty is addicted to Diet Coke and bought a case of it. The night we bought it we forgot to take it out of the car and in the morning we'd found it had all frozen and burst the cans it was in. We told Will it was going to be cold but we don't think he realized just how cold -20C actually feels. Will said he thought he was never going to get warm again! Will wanted to spend a couple of days in Chicago again before he flew home so Patty and I paid his airfare from Indianapolis to Chicago where he spent a couple of days in a hostel before going back to the UK. When I came over to see you just after Xmas I'd stopped taking my medication even though Patty always told me never to do this. Needless to say she was right and a few weeks after I got back to the UK I started suffering badly with anxiety and went straight back on the meds. Sadly they haven't really worked this time - I've been ill since then and there isn't much sign of me getting better. I wonder afterwards whether the way Patty burst into tears when we said goodbye at the airport reflected that she knew I was in trouble. Anyhow, I'm now on a high dose of anti-depressants and hoping that they will help but without much confidence. Needless to say I should have listened to Patty. Maybe I would have got ill even if I'd stayed on the meds but that's something I'll never know now. Thanks again for looking after me. What happened was that Patty was genuinely fond of Will and was sorry to see him go. We were both worried about him after reading that email and I wrote to him saying if he didn't feel any better and if he thought it would help then we'd pay for his flight back to the US to stay with us for a while longer. that's a really generous offer - I'm speechless. At the moment I'm now on 4 times the dose of anti-depressants (effexor) than I started on when I first got ill in March. I've been on them for 5 weeks and vaguely hope they might help me if they start to kick in which they might do in 6-8 weeks. I've never been tested for Lithium deficiency but there again I've never displayed manic phases. I'll ask them about this when next see the medical people, though the NHS isn't very full on when it comes to mental health - you have to be in danger of eating babies before you get serious attention. I am getting Cognitive Behaviour therapy at the end of August which might help. That time it was well into October before Will felt anything like his old self. He'd started working with Steve Rose, got lodgers in his house in Totterdown. 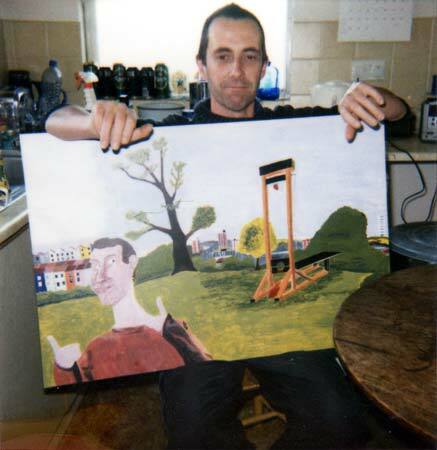 his finances were much better, he was getting CBT which seemed to be helping him and he was generally more upbeat and interested in art and politics again. Something he made that month was a "giant illuminated heart called "Lord, soothe my troubled heart", a glass head full of empty anti-depressant packaging called "Cured" and a giant dice called "Fat Chance". I would have liked to have seen that. We were in the UK for Christmas and New Year in 2005/2006 saw Will and a whole group of other people on New Year's Eve in the Oxford. Some nutcase started peeing against the bar there so we all moved to the New Found Out, another of Will's favourite bars. Will was as amusing as I'd ever seen him and he later emailed me saying how much he enjoyed himself. In December 2007, will sent a picture of his house that had been painted by one of his lodgers, Ollie Gillard. 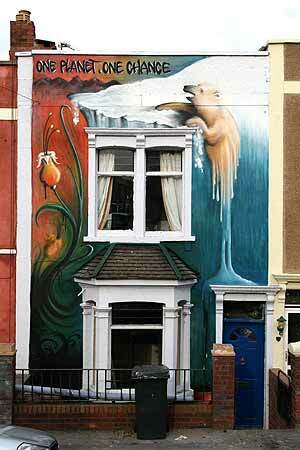 Will's house had been dedicated to art related to climate change for that years Totterdown Frontroom Art Trail. Will would email me often, keeping me up to date with what he was doing, whether it was just personal stuff or his work for Transition Bristol, Front Room, Kebele Community Group, Bristol Anarchist Bookfair Collective, Bristol Radical History Group, MIND, CAB and everything else he was interested in. The last email Will sent me was in February 2010, saying that he'd been ill for the first time in 4 years. He'd had another nervous breakdown, had spent two months at his parents and was back on his meds but felt like he was getting somewhere back to normal. The next I heard anything about Will was that email from Steve Rose and then the horrible phone call where he had to tell me that Will was dead. 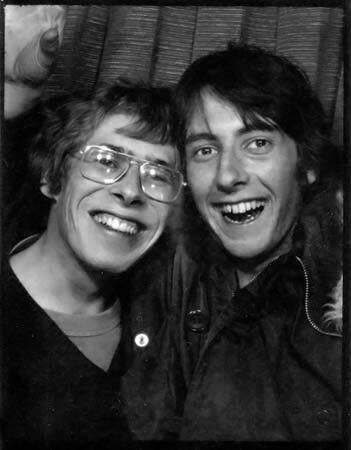 A couple of days later Steve emailed me again with the date of Will's funeral service which took place at South Bristol Crematorium at 3:30pm on Friday, 1st October and I started making the arrangements for the long trip home to say goodbye to my friend of 40 years. My mum had always liked Will and was very upset when I phoned her to tell her why I was coming home at such short notice. The trip home was long and horrible. I couldn't get the various flights I needed to match up properly and so spent 10 long, boring, lonely hours at Chicago's O'Hare airport before getting the flight to Washington's Dulles and from there on to London. Mum and my brother picked me up at Heathrow and I finally got to Bristol around 1am Friday morning, nearly 30 hours after leaving my home in Terre Haute. 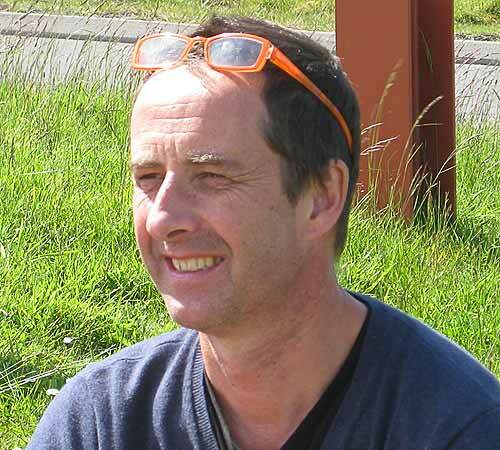 Will's service was a Humanist one and was great. It was attended by over 200 people - a testament to how loved Will was. The meeting at The Oxford afterwards was good as well. It was an opportunity to meet up with his family, many old friends and acquaintances and reminisce on the life of our friend. I spoke with Steve Rose who explained that Will had been ill almost the whole of 2010. He'd get over one bout of depression then after a couple of weeks respite go into another. Eventually it had gotten too much for him and he decided that he could no longer carry on. Will's early demise was such a waste. He was my friend and I miss him.